It's Irie: Miraflores Locks, here we come! Irie made it safe and well (with some stressful moments nevertheless) through the three Gatun Locks and is now moored in Gatun Lake. Tomorrow, we are supposed to cross the lake at 6:30. This trip should take 4-5 hours, after which we will pass through the Pedro Miguel lock and then on to the Miraflores Locks. Let's hope we'll see some crocodiles! We expect to be in the Miraflores Locks and on the webcam there some time between 13:00 and 14:00 (Belgium: 19:00-20:00). This time, I will send an update. I tried to do this for the Gatun Locks, but miserably failed because of a computer problem. The webcam in Miraflores is better quality anyway and... it is the last step before arriving in the Pacific Ocean. More tomorrow! Irie's crew has red shirts on and will wave to the webcam. 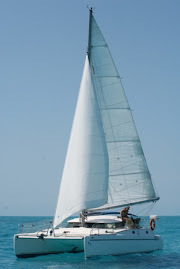 Today, we were tied to a big catamaran, who had a third sailboat to its other side as well. But, who knows what tomorrow will bring?